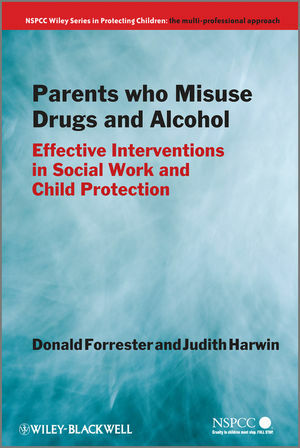 This book presents original research outlining the key elements in responding to parental misuse of drugs and alcohol. Donald Forrester is Professor of Social Work Research and Director of the Tilda Goldberg Centre at the University of Bedfordshire. Judith Harwin is Professor of Social Work and Director of the Centre for Child and Youth Research at Brunel University. 1 What is 'Substance Misuse'? 2 The Impact of Parental Substance Misuse on Child Welfare. 3 Parental Substance Misuse and Children’s Services. 4 The Social Worker Assessments. 5 What Happened to the Children and Their Parents? 7 What Works in Engaging Parents Who Misuse Drugs or Alcohol? 8 What Works? Substance Misuse Treatment and Evidence-Based Social Work. 9 Motivational Interviewing and Effective Work with Families in which Parents Misuse Drugs and/or Alcohol. 10 Family Interventions with Parental Substance Misuse.